Eduardo proudly displaying his roast. NASHVILLE, Tenn., U.S. — Mayorga Organics is happy to announce that Eduardo Choza has placed 4th among a field of 32 of the top specialty coffee roasters in the United States in the US Coffee Championships. 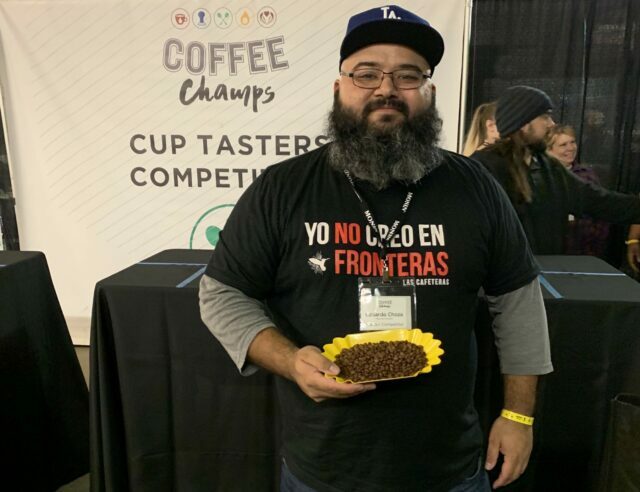 The competition was held in Nashville, TN and was attended by hundreds of the top baristas, roasters, and coffee tasters. As a finalist, Eduardo will move on to compete in the final round in Kansas City, Missouri in late March. In his presentation, Eduardo indicated that he was there to represent Mayorga’s farmers and staff as well as the underrepresented Latino community. “It was a risky move to use my limited time to verbalize that the Latino community is underrepresented in the industry and in that very competition, but I believe in speaking my truth and that it my truth. We as minorities need to make our presence known in an industry built on the backs of farmers from our nations,” states Eduardo. Mayorga Organics was founded by Guatemalan-born Martin Mayorga and operates with the purpose of alleviating systemic poverty through the direct trade or artisanal organic foods. They operate a state-of-the-art manufacturing facility in Rockville, MD with plans to expand their manufacturing capacities in other U.S. cities in the near future.